Hello, Menites and Heretics! 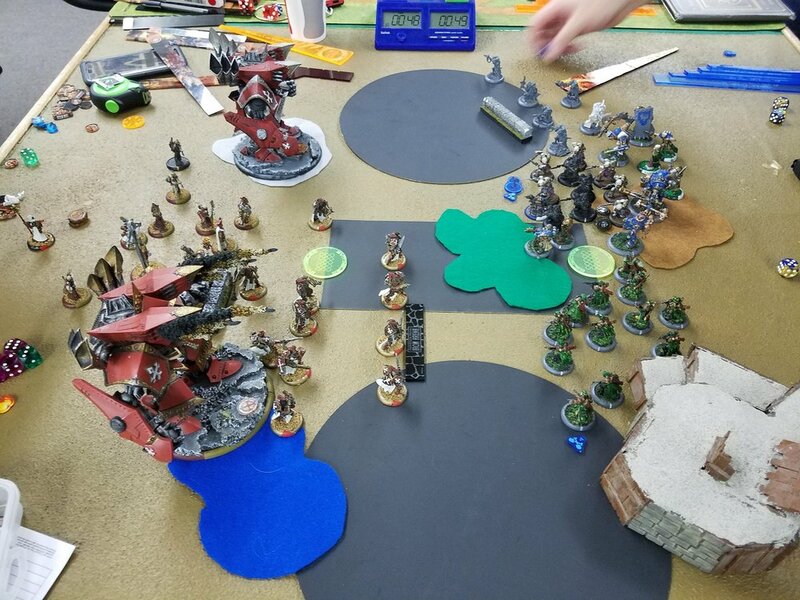 I recently had the great opportunity to travel up to Pocatello Idaho for the newest Warmachine Weekend Wildcard event within a reasonable driving range of me, the Gate City Brawl at Goblin Town Games. This is my first real event after the Exemplar Interdiction changes and I couldn't be more excited. Let's talk about lists, shall we? This event I went against my usual more snowflakey ideas and pulled a couple I really liked from the revealed WTC lists this year. Now, to be fair, I didn't go in going "I'm going to take some lists from this to use this year!" and in fact one of my lists was something else until pretty close to the event, but when I saw Mike Puryear's High Reclaimer list with two Judicators I knew I had to play it and, when I did, I completely fell in love with it and have been practicing it heavily in the weeks since. This list is *nasty* in all the best ways. It's quite surprising what you can drop it into, and performs pretty well into both armor (because these colossals hit like a truck) and infantry (they're basically AOE: The Colossal in addition to having two 10" sprays.) The Errants can clear a lot of early stuff as well as hit pretty hard if you toss Hand of Fate to them, but the real stars are the twin Judicators, typically each having Hand of Fate and of course benefitting from Eye of Menoth, and with 2 extra dice drop 2 lowest on attack and damage rolls they hit consistently and very, very hard. Stack on Mark Target from the Errant Officer and you can get to ridiculously accurate rockets and just.... absolutely absurd accuracy on the sprays. Some question why it isn't a Creator's Might list since you're only getting one free solo here, but the +2" deployment and Blessed weapons on the Judicators is absolutely invaluable. The other list was one I threw down against my co-host and favorite intern, Bret, over Vassal to test for the WTC against his Maelok Gatorman Posse list. Never intended to play it in an event, but after I gave it a go I just fell in love with it as well and had to quickly paint up all the heavy infantry I needed, since I owned everything to play the list already. All credit to Pete Leblom on Australia Wobbegong for this one since it is his build. This list is pretty much all business; the only support you've got are the min choir and rhupert, everything else can do some serious work (although a few have support elements to be sure.) It's surprisingly fast with Crusaders Call, Desperate Pace, the Cinerator mini-feat, and +2" deployment, and is super hard to approach with both armor and infantry with defensive strikes and her feat respectively. It's a lot of meat to chew through on a caster that keeps it all alive, and in the back you've got the new and improved Judicator just punishing things on the way in and crushing a heavy or two in the late game. That's the pair we took, so how did our games go? Round 1 was a player named Kyle who I don't believe I've met before. He brought Crucible Guard, a faction I haven't had the pleasure to play against since they released, so I knew this would be an interesting experience. Overall I didn't feel comfortable dropping Harbinger into this due to the ranged presence that was definitely capable of cutting through most or all of the heavy infantry, and I felt like High Reclaimer, even though I was going to be dealing with the great reduction in usefulness of my sprays in particular, had pretty good game here. I won our roll off and opted to go first, and he opted to take a side that had a trench to live in since my blast damage is pretty vicious. First round was spent running at each other, and he opted to have the Rocketmen get their +2 SPD and run, moving way upfield. I expected them to get a Defensive Order and just move up while being immune to blast damage, so this gave me a pretty good opportunity. One Judicator wiped out most of the Rocketmen, leaving 4 alive, while Errants killed an Assault Trooper and mostly just spread out. The other Judicator killed a few more Assault Troopers with rockets and didn't do any sprays, so only two Troopers were left. His two remaining Assault Troopers got cleared of errants. I was able to keep Rust off my Judicator with a shield guard, but it ate a couple hits from guns and the Assault Troopers hit it like a wrecking crew with Transmutation, rolling massive damage rolls and putting it much closer to death than I liked (though still over half alive.) My other Judicator was largely unscathed, with Errants eating most of his other attacks and the remaining Rocketmen pushing for a flank around to my backline. That Judicator then spun to one side and sprayed/rocketed most of the remaining Rocketmen down, killing a few other odds and ends, and I cleared one of the Assault Troopers and Hutchuck, as well as feating a mass of Errants back, swapping Hand of Fate to them, and exploding his Suppressor. I also jammed up one of his Vindicators with Errants so he'd have to clear them to get to my Judicator. He was forced to use his other Vindicator to clear the jammed one, which charged my Judicator but was unable to quite finish it out. This round I started swinging scenario in my favor, repairing the heavily, heavily damaged Judicator up just enough to get it up and running again to smash the Vindicator, the other Judicator clearing the far left zone and objective, and clearing enough of the center zone to actually score it, putting me up 3-0. His turn he charged into the Judicator with his other Vindicator, killing it, and cleared some of my support and remaining Errants, but this left Reclaimer on a good number of souls. He contested the left zone, but on my turn I was able to trivially clear it out, and the Reclaimer himself got Harmonious Exaltation, grabbed focus off a Wrack, cast Hand of Fate on himself, and went into his Vindicator with 9 focus, easily removing it and letting me score up to 5-0. Photo from TO, my hands got all up in the way. Overall was a tough game; opponent forgot to feat on a couple key turns, so didn't get it out until late, but this is a pretty new faction for everyone. I made plenty of mistakes as well; I kept thinking Passage was a bit of a waste because of the Vindicator's ability to shoot through it, but it occurred to me a bit too late that by doing that they don't get their additional die against constructs... seems obvious but took a bit longer to click than it should have. Either way... onward, to round 2! Round 2 was vs. Tucker, I believe (forgive me if that's not exactly right, names start to escape me after a day or two), who was playing Retribution. Our scenario was Recon II, and I forget his exact pair but he played Garryth. This was a bit of a jank list, and my opponent knew it, running out of theme to take Halberdiers and Mage Hunter pieces in the same build. I'm not 100% certain on the Lys Healer, there was 3 points left and I think there must have been one. This game is hard to talk about too much; my opponent was very nice and wasn't salty in the slightest, he knew full well he was playing sub-optimal stuff and was mostly there to just have fun and see how it played out (it had worked out for him in the first round.) He won the roll off and opted to go first, I took a side that gave Harbinger a perfectly positioned wall to hide behind. This stuff ran up, my stuff also ran up and I feated to keep most of his army off of me. Top of 1 the Judicator was nice enough to kill four Halberdiers with AOEs, as well as do 3 damage to Moros. He had a Griffon come in and eat a bit of damage between a defensive strike and the feat, otherwise just spread out, but couldn't do much; I proceeded to destroy two Griffons, Moros, a Mage Hunter Assassin, he left Narn and Eiryss touching his objective so the Judicator killed both easily as well as a Mechanik, and his remaining Griffon had no cortex and a broken spear arm. On his turn he had his remaining Halberdiers charge in, two of which died to Defensive Strike, and with Awe and Set Defense, as well as some terrible rolling on his part, he hit... no attacks. At that point he conceded. There's not a lot to say about this one. Opponent was seriously super friendly, we had a great chat on his clock for a while sort of joking about things or talking about how he could maybe sneak something through to Harby (spoiler: he couldn't) and eventually we just sort of started picking up models and I went to get lunch, which was great because my first round went really, really long. Round 3 was against one of my locals, who I have played against a ton of times. As a Cygnar player, he wasn't looking forward to this as he has been bashing his face into the High Reclaimer Judicator matchup for over a month now, between two of us playing it in my local meta (although the other Protectorate player is running single Judi and Vengers). We knew what the fight would be before we started, so we just went ahead and dug in. Our scenario was Invasion. He played Siege2 Gravediggers, I dropped High Reclaimer. This was a very, very tight matchup and I knew it, and it didn't help when he won the roll to go first. This game is very different if I get first turn, but... he has a +1 and I don't, so that's an advantage he gets. His stuff all ran or walked and dug in. I'm not going to go into too much detail on this one because it was an absolute slog, but basically I was concentrating fire on his Commandos and killing a few a turn, and he feated but forgot to move a good chunk of his army, getting too excited and moving on to his Furied Trencher Infantry to send in about 8 of them to kill one Judicator super early. Due to his forgetting to move from the feat, though, the other Judicator all but wiped out a unit of Infantry, and with some help from Errants, the right side of the board was mine, and due to a forest in the center he was going to have a hard time moving over to that side, while I had plenty to contest his side. In the late game, one of Rhoven's honor guard ran into the right zone and started scoring it for me (the rest of the unit was dead), while my largely untouched Judicator started moving to the left, clearing anything he could. Late, late game came down to Siege and Triumph against a half dead or so Judicator, but I was up enough on scenario to destroy his objective and score both circular zones (go, scoring choir, go!) for the win. This matchup is ridiculously close. We've personally played the exact matchup twice, and I've won both but both times it was by the skin of my teeth. That said, I love this list into Cygnar, as I think Siege2 GD is one of the best options they have into it and it's pretty much a 50/50, whereas the usual terrors like Haley3 I think just fall apart utterly. Storm Division hits hard enough but just doesn't get across the table well enough under the punishing fire of the Judicators (the rockets will typically kill a Storm Lance on blast damage... which is gross), so the best other options are probably some kind assassination focus, which could definitely work. Picture taken right before the silver Judicator utterly exploded. The finals! This round was against Nathan, a former local who moved up to the Idaho area a while back. He plays Circle, and was running Kreuger2 and Baldur2, both in Bones. I knew he was dropping Krueger, since Baldur is so... so bad into both of my lists on account of the mass Blessed and huge damage output, and I didn't really like the idea of double Judicator into Krueger so our matchup was Harbinger v Krueger on Standoff. Going to be honest... this one was pretty advantaged to me from the get go. He's bringing a pretty low volume of highly valuable pieces into my heavy infantry weapon master swarm. The main advantages he can leverage is the sprays from Sentry Stones and the Fulcrum, as well as the high volume of attacks from the two Woldwyrds and TK to break up my shield wall. I got the opportunity to go first and took it, and basically just ran at him. On the approach I ate some damage, the Cinerators getting mostly destroyed due to a Gallows Grove, TK's a charging Megalith, etc, and then he feated, but between Vengeance, Desperate Pace, and Crusaders Call, I still got a Cinerator and five Bastions onto Megalith, killing him easily while the other Cinerator killed his Gallows Grove, which was a hard counter to Martyrdom. He then got another turn of shooting and melee, doing some good work on one Bastion unit but overall just not doing enough, and he was forced to leave his Guardian and Woldwarden in range of my Judicator. The Judi and a pair of Bastions cleaned up the two heavies, five Bastions killed his Fulcrum, and at this point he's in desperation mode (tactically, this game was actually quite jovial, we had a great time talking and joking the entire time.) Krueger walks up into the forest in the center and boosts TK's into Harbinger, connecting on the second one due to Awe. He turns her around and pulls her away from my shield guards, but the only thing that can attack me is a single Woldwyrd. However, I'm camping one and on 8 hp so it could easily kill me. Divinity, though, says that opponents don't get back strike bonuses on me, so he was forced to go for 8's, meaning he really needed to boost his hits. He boosts his first two attacks, rolling a 7 and a 6 which was abysmal, and the third shot also misses. At this point Kreuger is camping 1 and standing in the middle of my army, so he concedes, giving me the first place victory. Unfortunately no picture was taken of this round. You don't win an event without getting a little lucky on at least one round, and that assassination run had me scared but overall I pulled through. Was a great event, was fun to play with some people I hadn't seen in a while, as well as some new faces, and I'm glad I was able to make it up there to throw around the new Exemplar stuff (as well as of course the new colossal!) I'll likely be playing these lists for a while, the pair is really nasty and has only a few real cracks in the armor that I've been able to find. Thanks for reading, and see you all around!